MAMMOTH LAKES, California (CNN) -- A small amount of human remains has been found in the wreckage of the plane that adventurer Steve Fossett was flying when he disappeared last year, a National Transportation Safety Board official said Thursday. The wreckage of adventurer Steve Fossett's plane was found in California's Sierra Nevada on Thursday. A search team that was examining the wreckage, which was found Wednesday at an altitude of about 10,000 feet in the Sierra Nevada near Mammoth Lakes, found "very little" remains among the debris, acting NTSB Chairman Mark Rosenker said. Asked whether the remains were enough for an identification, Rosenker said, "I believe the coroner will be able to do some work." Investigators homed in on the area near Mammoth Lakes on Wednesday after hikers there found a sweatshirt, cash and identification cards with Fossett's name. The hikers did not find any wreckage; an aerial search discovered the airplane parts about a quarter-mile away, Anderson said. Ground crews confirmed Wednesday night that the wreckage was Fossett's plane. The sheriff said authorities were not certain whether the cash and sweatshirt belonged to Fossett. The engine was about 300 feet higher on the mountain than the fuselage and the wings, Anderson said. An NTSB team arrived Thursday to investigate the crash. 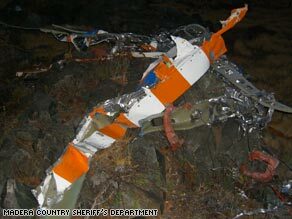 Rosenker said investigators, based on examinations of the debris, believe that the plane struck the mountain horizontally but not necessarily head-on. Fossett's disappearance prompted a search that ultimately included thousands of volunteers, hundreds of officials and dozens of aircraft poring over an area more than twice the size of New Jersey. The search was officially suspended a year ago Friday, and a Chicago probate court judge declared Fossett dead in February.